Protect ice from dangerous contamination during transport with Saf-T-IceÂ® Tote from San Jamar. This dedicated ice tote features an integrated comfort handle with raised Tri-gripsâ„¢ to prevent hand contamination and for easy and safe pouring at any level. Patented HACCP Hangerâ„¢ attaches to ice machines for faster and more efficient filling of ice totes. 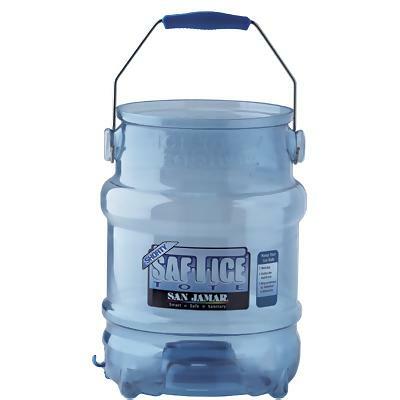 Part of the San Jamar's Safe Ice Handling System, use the Original Saf-T-IceÂ® Tote for high-capacity carrying (25 lbs. when filled) and manual cleaning. The Shortyâ„¢ model is designed for dish machine washing, with a smaller ice load capacity (20 lbs. when filled) that is lighter and easier to manage when filled. The optional Saf-T-IceÂ® Tope Snap-Tight Lid offers additional ice security and protection.